In honor of Army Ant Week, I’m going to take a short break from my recent Costa Rica photos to post a few army ant photos. 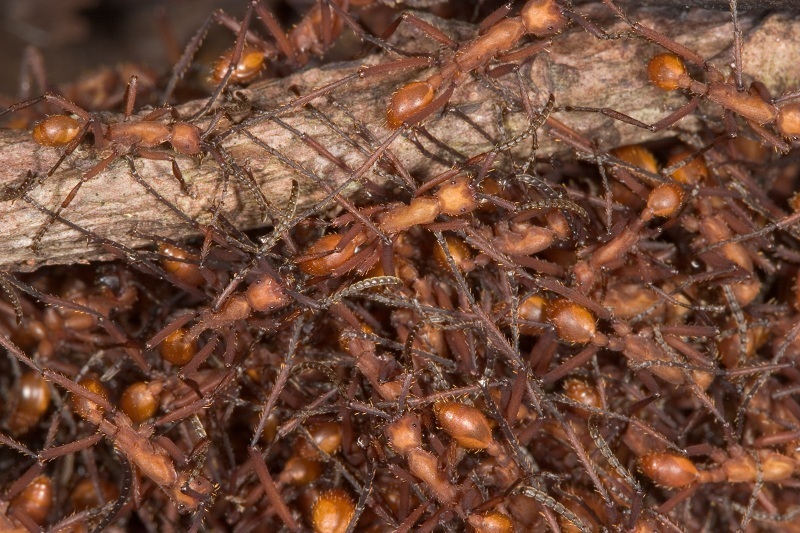 The only time I’ve ever seen an army ant bivouac was on a trip to Panama. I don’t recall if the photo above was of part of the bivouac or just an ant bridge somewhere along a foraging trail. My field notes were unfortunately lost in a house fire several years ago. This could be Eciton hamatum, based on Alex Wild’s post today on that species. They are definitely orange, and I don’t recall being bitten or stung. If they are some other species, I’m sure I’ll be set straight in short order. I encountered some army ants on my recent trip to Costa Rica, but I gave up on any photos. The few times I approached a column, they quickly started swarming up my boots. It almost seemed like they had a sixth sense or something. Even though I wasn’t in their direct path, they always seemed to gravitate towards me. I have some other army ant photos that I’ll try to post before Army Ant Week is over. Also, don’t miss these army ant observations from about a year ago. At least I think they were army ants. I keep waiting for someone to tell me they were something else. Yep, looks like E. hamatum to me. Welcome to army ant week! Just found your site and loved your photos. Your site will now become a regular for me as I love nature photography myself. I am a retired university biology professor here in Arkansas and I too am originally from Georgia, Albany to be specific. Again, I love your website and photos! Thanks for visiting and for the kind words.